Here we are at the beginning of summer! ‘tis the season of grilling and barbequing…and, of course, feeling superior for knowing what to grill and barbeque (grass fed burgers, pastured chicken) and what not to (corn-fed hamburgers, hormone filled industrial chicken). But let’s get real – not everybody is as astute about real food and foodiness as you, my dear listeners are. And, unfortunately, you can’t expect every friend will know to serve pastured deviled eggs and artisanal hotdogs. Which poses a problem: you want to be the right kind of “us”, but you don’t want to be the “them” who turns down a non-artisanal hotdog your best friend’s boyfriend brought to you on a paper plate. What do you do? So in tonight’s leftover episode from last summer – Friends Don’t Let Friends Grill Tofu Hotdogs – I get real about what foodiness has done to complicate summer barbeques; that you now know too much to serve tofu burgers, soy chips and strawberry-flavored vitamin water, but if you do your friends will think you’re “healthy”; that if you serve up classic American junk food like corn-fed industrial hamburgers, potato chips and Budweiser you’ll have fun, but your friends will think you don’t know any better; that if you have a real food extravaganza of grilled, pastured, farm raised hens and local, grass fed burgers and artisanal beer you’ll make a statement that you are better than people who don’t know better, but you won’t have any fun, or any friends; and that your options are to either serve junk food, but leave out a Whole Foods bag so everyone thinks it’s real, serve real food but balance it off with Puerto Rican rum and Kool-Aid, or just let the Orthorexia win and don’t eat anything…because nothing tastes as good as being superior. 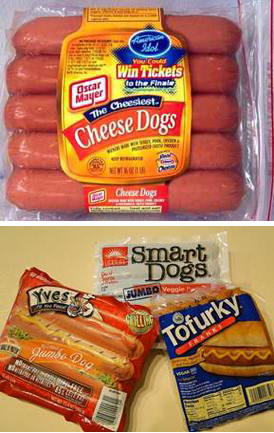 Oh, and it is okay to decline a tofu hotdog. The question is, rather, why are you friends with someone who would serve a tofu hotdog? So if you want to be the right kind of “us” and still have friends and not wind up at parties catered by Organic Avenue, tune in! !